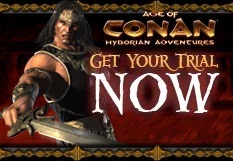 Out of pure self-interest, I’m going to blatantly promote Age of Conan by mentioning the press release just released (duh, obviously) that announces the offer of a free, everlasting Age of Conan trial (aka “Unlimited Free Trial”). Basically, if you sign up for a trial account, download and install the game and then log in at least once before January 1st 2010, the trial account will never end and you can keep on hanging around in Tortage (level 1-20 area) for as long as you want. Some limitations apply to the trial accounts (out of necessity due to the potential abuse by spammers/gold sellers), though; no trade with other players, no use of in-game mail, no public chat channels, no forum-posting access. Anyway, that’s this year’s Age of Conan (Available in a retail store/webshop/Steam near you!) promotion (Buy now! Don’t hesitate!) from me (Buy your friends a copy too! And your mom!). Now going back to my regular schedule of updating this blog at random intervals.